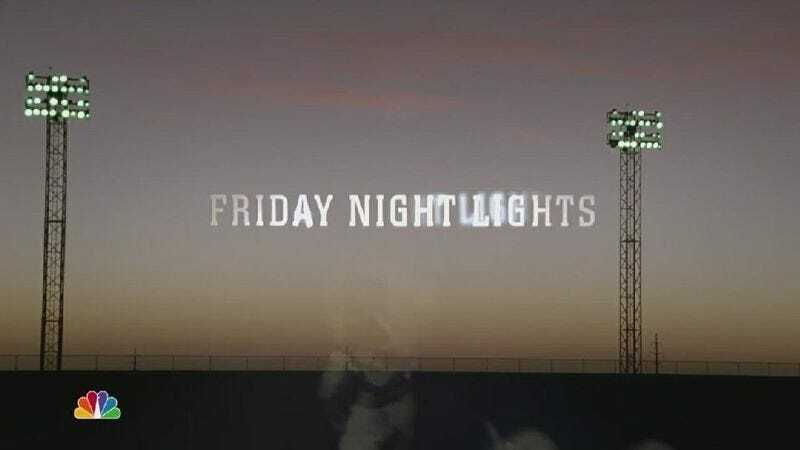 Friday Night Lights: "After The Fall"
“You’ve lost your inner pirate,” cameoing Texas Tech coach Mike Leach tells Coach Taylor at a random encounter at a gas station in the second episode of the fourth season. Being a casual, at best, football fan, I had no idea who Leach was. I thought this was just some random loon giving Coach advice, albeit a random loon who might be on to something. Last week saw Coach throwing in the towel after barely making it through a brutal first half of his debut appearance as the coach of the East Dillon Lions. I honestly had no idea how that decision would be received. (Well, I had some idea having watched the preview for this week’s episode.) Hardly anyone showed up for the game and the team looked like it wanted to be put out of its collective misery at halftime. And yet nobody took Coach’s surrender well. Come Saturday morning he wakes up to find white flags of surrender planted in his lawn. Shortly thereafter he learns he’s royally pissed off his team, even the ever-loyal Landry. Inner pirates don’t die easily, it seems. 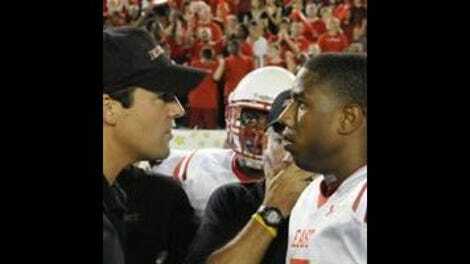 By episode’s end, Riggins has drifted back into Coach Taylor’s circle (as, presumably, another assistant coach of some kind.) Buddy’s started to drift as well, pointing out that Luke Cafferty, one of Dillon’s stars should really be attending East Dillon, since the address at which he lives doesn’t technically exist. This becomes something of a huge deal, leading Tami to confront both the boosters—in an amazing scene in which she makes Joe McCoy realize he’s playing chess against someone who knows the rules of the game—and her husband, who has to confess to turning a blind eye to booster shenanigans in the past, even if he might not have known about this particular shenanigan. About Luke Cafferty: Was everybody else as instantly won over by new cast member Matt Lauria as I was? What a terrific introduction, showing the kid at his most vulnerable as he politely weeps in the rain and insists he’s fine while watching the future that others had planned for him disappear as he’s forced to do the right thing. We don’t see a lot of him this episode, but he makes his moments count. I also like the final new addition to the cast (that I know of), Jurnee Smollett, who plays Jess Merriwether (“M-e-r-r-i-w-e-t-h-e-r”). (She first caught my eye in the underrated roller skating movie Roll Bounce a few years back.) So far her storyline with Landry seems a little telegraphed—the meet-cute, the protective father, etc.—but I suspect it will get a little more nuanced as the season progresses. (That’s The Practice veteran Steve Harris as her dad.) It’s also yet another sign that this season won’t be shying away from Dillon’s racial divide, something previous seasons had only noticed from time to time. Speaking of which, we see where Vince comes from this week and it’s not pleasant. His mother looks to have some serious impediments to parenting, hitting up Coach for a twenty before she’ll tell him where to find her son. When he does find him there, he’s not only pissed at Coach giving her mom some money, he’s stuck in a situation where even if he thinks reconciling with Coach is a good idea, he can’t make the move without losing face with his friends at the basketball court. Tough call. Meanwhile, somewhat removed from the rest of the action, Matt begins his apprenticeship with local artist Richard Sherman, a “genius” by the reckoning of the art teacher so dismissive of Matt’s work in last week’s episode. (Sherman’s played, gruffly, by veteran character actor John Diehl.) Best moment of this storyline: Matt showing up to his internship in what’s essentially a junkyard, wearing a nice suit. Second best: Sherman finding the one part of Matt’s sketches that doesn’t make him want to puke and Matt, for the moment, taking him seriously. For all the junk hauling he’s forced to do, this might be a real apprenticeship after all. Finally, there’s the moment when Coach starts to pick the team up again, the whole team, even those who walked out after his tirade last week it seems, by burning the game tapes and the uniforms and everything left to remind them of the half-assed squad they were before and hopefully never will be again. But it’s going to take a lot of pirate spirit and if I know the show at all it’s going to make sure we see just how tough it is to climb back from the bottom. • Connie Britton’s delivery of “Drinkin’ wine” makes me laugh. • I’m still a bit confused about the redistricting. Everyone has to go where they’re assigned and yet Julie can choose to go to East Dillon out of solidarity with her friends. Huh? Maybe the Taylors live exactly on the dividing line? • So now both Dillon and East Dillon have a forfeit. Could this lead to a showdown? Would they even be in the same division? (Again: Casual football fan.) I cross-town confrontation seems like the obvious story, but will they go that way?